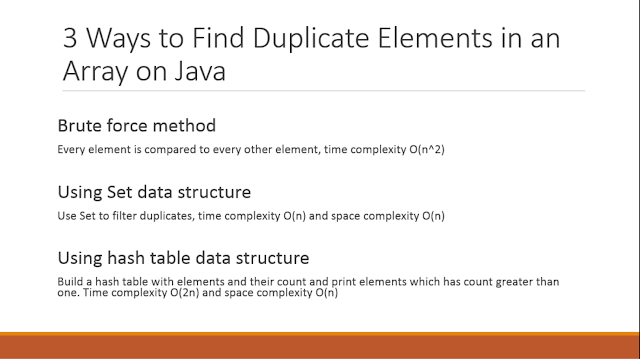 There are multiple ways to find duplicate elements in an array in Java and we will see three of them in this program. Solution and logic shown in this article are generic and applies to an array of any type e.g. String array or integer array or array of any object. One of the most common way to find duplicates is by using brute force method, which compares each element of the array to every other element. This solution has the time complexity of O(n^2) and only exists for the academic purpose. You shouldn't be using this solution in the real world. The standard way to find duplicate elements from an array is by using HashSet data structure. If you remember, Set abstract data type doesn't allow duplicates. You can take advantage of this property to filter duplicate elements. This solution has a time complexity of O(n), as you only need to iterate over array once, but also has space complexity of O(n) as you need to store unique elements in the array. Our third solution to find duplicate elements in an array is actually similar to our second solution but instead of using Set data structure we will use hash table data structure. This is a pretty good solution because you can extend it to found count of duplicates as well. In this solution, we iterate over the array and build the map which stores array elements and their count. Once the table is build, you can iterate over a hash table and print out all the elements, who has a count greater than one, those are your duplicates. How to find duplicates in Java array? In the first paragraph, I have given you a brief overview of three ways to find duplicate elements from Java array. Now, let's understand the logic behind each of those solutions in little more detail. Our first solution is very simple. All we are doing here is to loop over an array and comparing each element to every other element. For doing this, we are using two loops, inner loop, and outer loop. We are also making sure that we are ignoring comparing of elements to itself by checking for i != j before printing duplicates. Since we are comparing every element to every other element, this solution has quadratic time complexity i.e. O(n^2). This solution has the worst complexity in all three solutions. 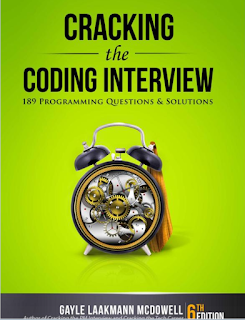 This question is also very popular on programming interviews and if you are preparing for them, I also suggest you to solves problems from Cracking the Coding Interview: 150 Programming Questions and Solutions. One of the best book to prepare for software developer interviews. Complexity of this solution is O(n) because you are only going through array one time, but it also has space complexity of O(n) because of HashSet data structure, which contains your unique elements. So if an array contains 1 million elements, in worst case you would need an HashSet to store those 1 million elements. Time complexity of this solution is O(2n) because we are iterating over array twice and space complexity is same as previous solution O(n). In worst case you would need a hash table with size of array itself. Here is our three solutions packed into a Java program to find duplicate elements in array. You can run this example from command line or Eclipse IDE, whatever suits you. Just make sure that name of your Java source file should be same as your public class e.g. "DuplicatesInArray". I have left bit of exercise for you, of course if you would like to do. Can you refactor this code into methods, you can do that easily by using extract method feature of IDE like Eclipse and Netbans and write unit test to check the logic of each approach. This would give you some practice in refactoring code and writing JUnit tests, two important attributes of a professional programmer. * print element with count 1. System.out.println("found a duplicate element in array : "
System.out.println("Duplicate element from array : "
From the output, you can see that the only duplicate element from our String array, which is "Java" has been found by all of our three solutions. That's all about how to find duplicate elements in an array in Java. In this tutorial, you have learned three ways to solve this problem. The brute force way require you to compare each element from array to another, hence has quadratic time complexity. You can optimize performance by using HashSet data structure, which doesn't allow duplicates. So a duplicate element is the one for which add() method of HashSet return false. Our third solution uses hash table data structure to make a table of elements and their count. Once you build that table, iterate over it and print elements whose count is greater than one. This is a very good coding problem and frequently asked in Java Interview. It also shows how use of a right data structure can improve performance of algorithm significantly. First solution : you should start j from i+1 instead of 0. How do you guarantee that two different values stored in the list do not have the same hash ? It doesn't matter if two different values have the same hash if you are using a class such as HashSet or HashMap. The value of the hash indicates a set into which the entry will be placed, not the actual location of the entry in the set. At least, that is how I read the JavaDoc for the classes. what is the best way using Java8? @sapan, you mean best way to learn Java8? or you mean using it on your real project? In case of first try solving programming problems like this using Java 8, for the second use Java 8 with collections and streams. I am a bit confused here with the first solution. How does it guarantee to return duplicate values without first sorting the array? Any idea without using extra space ? Hello @Vivek, the first solution is without additional space but time complexity is O(n^2), I don't think there is a solution with O(n) without any additional space. How to find duplicate number from 1 to N.
@Anonymous good solution. didn't know about the Collections.frequency() method, is that newly added? it will give us wrong answer if we have a element more than two times.